As the weather warms up, my food cools down. This seems to happen every single year without my even noticing. A couple weeks ago while blending up a green smoothie, I realized that the seasons must be shifting because my body is suddenly asking for different foods. Besides frosty drinks and fresh fruit, I have been getting back into Bircher muesli, or as it is also known, overnight oats. This is a perfect summertime breakfast – light, raw, and refreshing, yet filling at the same time. If you like a warm bowl of oatmeal porridge in the colder months, I think Bircher muesli will be right up your alley for this time of year. And if you’re a particularly busy person, you’ll also fall in love with the incredibly simple prep that leaves you all that extra time in the morning for eating instead of fussing about in the kitchen (or an extra hit of the snooze button). 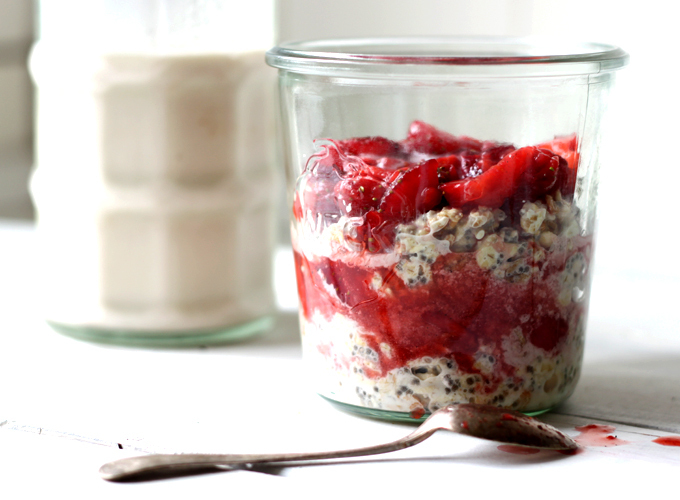 Bircher muesli was invented in Switzerland by a physician named Maximilian Bircher-Benner. Bircher-Benner had this ‘crazy idea’ of feeding convalescing patients raw vegetables and fruits, nuts and whole grains as a means to heal them – a practice contrary to many of the beliefs held at the end of the 19th century. Inspired by observing the simple, healthy life of Swiss shepherds, he also believed that people are most balanced living in harmony with nature. What a nut job. Okay, enough sarcasm. I genuinely love this breakfast because it is so easy, so satisfying and so very, very good for you. Quite simply, Bircher muesli involves soaking oats in a liquid (milk, water, yogurt), placing them in the fridge overnight, and eating them in the morning. If you like eating raw foods for breakfast, but do not always feel “full” after, this is the perfect meal to try because it satiates with high-quality carbohydrates and plenty of whole grain fiber. You can dress overnight oats up however you like with nuts, seeds, coconut, fresh fruit, superfoods, jam, honey, maple syrup, yogurt etc. For this recipe I made a raw strawberry sauce that is similar to a jam, but without any processed sugar. I usually add this to the oats in the morning, but if I know that I have to get up and go first thing, I will layer it all in a jar the night before and take with me on the run. So convenient and delicious! If you are kind of person that doesn’t like to eat as soon as you wake up, this is a perfect solution too. Take the container of soaked oats to work and wait until you’re really hungry to enjoy – this is the healthiest thing to do anyway, as we should never eat before our body gives us true hunger signals. Get on the soaking grains train! All grains contain phytic acid (an organic acid in which phosphorous is bound) in the outer layer or bran. Untreated phytic acid can combine with calcium, magnesium, copper, iron especially zinc in the intestinal track and block their absorption. This is why a diet high in unfermented whole grains may led to serious mineral deficiencies and bone loss. The modern misguided practice of consuming large amounts of unprocessed bran often improves colon transit time at first but may lead to irritable bowel syndrome and, in the long term, many other adverse effects. Soaking allows enzymes, lactobacilli and other helpful organisms to break down and neutralize phytic acid. As little as seven hours of soaking in acidulated water will neutralize a large portion of phytic acid in grains. The simple practice of soaking cracked or rolled cereal grains overnight will vastly improve their nutritional benefits. There are many variations on Bircher muesli, or overnight oats, but I will give you my simple version. Feel free to play with the recipe to achieve a final product that works for you. I really like adding chia seeds to the oats before soaking because they absorb so much of the liquid and create a lovely, pudding-like consistency. Chia also boosts the nutritional value of the breakfast bowl with Omega-3 essential fats, protein, antioxidants, extra fiber, as well as calcium, phosphorus, magnesium, manganese, copper, iron, molybdenum, niacin, and zinc. This is one of the most versatile and satisfying raw breakfasts I know of – definitely one to try for anyone who needs a lot of energy to get them through the morning all the way to lunchtime. 1. Fold all ingredients together in a jar or bowl, place in the fridge overnight. 2. In the morning, remove muesli from the fridge and let stand at room temperature for 10 minutes if desired. Layer in more milk, yogurt, and the Spiced Strawberry Sauce with more fresh fruit. Enjoy. I was most definitely moved to create a seasonal sauce for the Bircher muesli because although it is delicious on its own, it has a relatively neutral flavour that acts as a base for so much more! And seeing as the Danish strawberries are now available, I couldn’t help but use them. This sauce is insanely delicious. The sweetness of the berries explodes onto a background of warming spices, vanilla, and citrus. It is bright and bold, clean and complex – a truly addictive condiment. I made an entire batch and ended up “accidentally” eating all of it in one sitting because I could not put it down. Ahem. While sitting alone in my kitchen, silently plowing through this gorgeous creation, I came up with all sorts of other uses for it besides just eating it out of the jar. 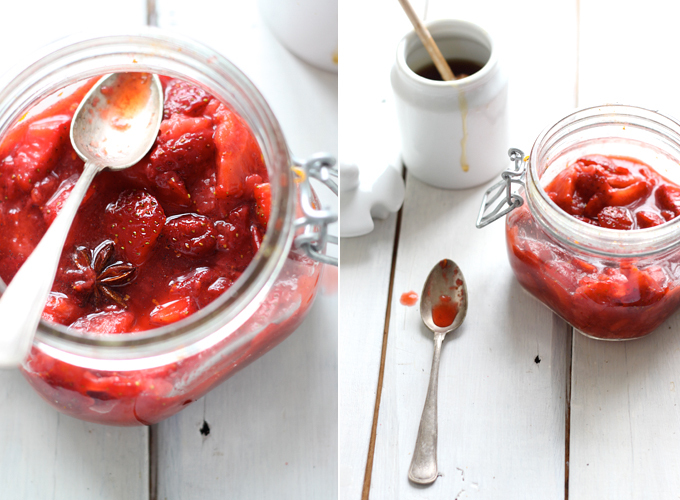 I know that Spiced Strawberry Sauce would get along famously with pancakes, yogurt, ice cream, and it would make an incredible filling for my Almond Butter and Jam Sandwich Cookies. Get creative or remain lazy – any way you eat it will be delicious. 1. Wash and cut the strawberries in half, or into quarters depending on their size. Place in a large jar or container. Add all other ingredients and using a muddler or a large spoon, smash the berries extracting their juices, but leaving some of the whole. Be sure to crush the whole spices too (you may want to use a mortar and pestle before placing them in the jar). 2. Cover with an airtight lid and place in the fridge to marinate (at least an hour). Keeps for a week. Serve with Bircher muesli, or on pancakes, yogurt, ice cream etc. Seeing as there are so many versions of Bircher muesli out there, I would love to hear your suggestions on toppings and add-ins! What do you like to put in/on your overnight oats? Leave your suggestions in the comments section. Thanks! Last weekend’s classes in Amsterdam were a huge success. If you would like to check out the photos from out two fantastic days of raw food fun and feasting, check out my Facebook page, here. And there are lots more classes in the works. Stay tuned for the upcoming summer schedule…I could be coming to your city! ps – a huge thanks must go to Jana for sending some of her luscious vanilla beans all the way from the island of Reunion. You can check out Jana’s amazing travel blog here! This sauce is absolutely the most exciting thing to do with sub-par strawberries. What started out as disappointment with some bland berries from the market turned out to be the greatest thing to happen to my breakfast game this year. Thanks so much for this recipe. That’s amazing. I eat exactly the same breakfast. I make huge bag of Bob’s Red Mill oats, ground flax seeds, walnuts, dried apricots, and toasted coconut. Every morning, l mix blueberries or fresh apple with a third-cup muesli and soy or almond milk. However, now I’ll mix it the night before to soak. Love it! Hi Sarah– Can you recommend a good sauce to make during the winter for the Bircher museli? Thank you! Awesome ! The recipe is good and delicious. This is perfect breakfast. I learned how to make Bircher Muesli many years ago from my music teacher, who had studied in Switzerland. It was made by soaking oats in youghurt overnight. The “essential” part was the addition of a grated apple the next day, mixed into the soaked oats just before serving. It makes such a nice addition, that I can’t make Bircher Muesli without it! Sarah, this has been on my to-do list for some time, and I finally got around to making it. That strawberry sauce is divine! Such a delicious breakfast. Bravo for another fabulous recipe! Thank you for this! I made it last night, substituting the strawberry sauce (it’s winter in Canada, I try to keep at least somewhat in season) for candied ginger, and it was absolutely divine. I’ve been reading about overnight oats for a while, but this finally made me take the plunge. The chia seeds add great texture that really helps break up the oat monotony. A breakfast staple now-many thanks. I add the almond meal after making almond milk. Then for an Austrian inspired twist (they love their poppy seeds) I added ground poppy seeds to the muesli part and served it with soaked dried prunes, then puréed and flavoured with lemon and cinnamon. Thank you for solving a mystery of what fruit I tasted almost 35 years ago; at that time my husband and I were living in Puerto Rico, a friend asked us to watch their dog and each time we went to take the dog out, we took the liberty to eat some succulent fruit growing on a tree in their garden. On one occasion, in my greed for the fruit, I walked into some low hanging branches and was promply stung in my face by several stinging insects. That was the last time I had what I now believe was Passion fruit, I hope I’ll be able to purchase some soon, the taste is unique and unforgettable! Gosh Sarah I can’t tell you how much I enjoy reading your posts! And I learn so much from each one of them. Did not know Bircher muesli was named after a doc! The spiced strawberry sauce sounds great, nice to see something other than strawberries with balsamic. It’s strawberry season here in India so will try this in the coming weeks. This looks like summer in a jar. Gorgeous. As i live in the top end of australia in the tropics and mangos are in season at the moment tonight i made your spiced sauce topping with our neighbours mangos with not a strawberry in sight, the initial taste test is yummy so i am looking forward to breakfast! can you use already made museli not just oats? Mmm, made with muesli I would imagine would be fab! Did you try it? Sounds so good with nuts and raisins and other grains all soaked overnight. Thanks for the idea. So deliciously mellow ..but the strawberries!! I only added almonds and was thoroughly satisfied. I agree with the previous post, totally full, but light. I can’t wait to have it again and again with other mix-ins. Thank you for this recipe. I am new to your blog! This is my new “go to” breakfast. My boyfriend and I eat it every morning in one form or another. I started by making the spiced strawberries (and they were heavenly) but we wanted something even more simple and fast. Every night we put together the oats (either rolled, steel cut, or both) with the chia and usually either almond milk or hazelnut milk. We also soak cashews or other nuts in it overnight too (we add more milk for this). Then in the morning we spoon out a portion and top it with hemp hearts, cinnamon, and a different combination of fruit. Today we had bananas, peaches, and blue berries. Other times it’s mango’s, nectarines, strawberries, or what ever else is in season. This is the most fantastic, versatile, easy, and awesome breakfast I have ever discovered. I love it and it leaves us feeling full but light. Thank you so much for sharing it! This is so great! I’ve made it for the past two mornings and I plan to keep it as a staple. It’s so easy and delicious! I added salt which was really nice as well as chia, and I ate it with a almond milk and a rhubarb sauce and some maple syrup. I was thinking of trying steel cut oats since I’ve heard that they have additional health benefits. Is that true and do you think it would work? This is definitely my favorite riff on overnight oats! I love oats, but can only handle small amounts of them so this is a huge treat for me. I would eat this most mornings if I could. I love using hemp or homemade vanilla almond milk and topped with either raw strawberry sauce or juice chopped up fresh strawberries, mercy! Delicious! So excited to find your blog. I have made three things from it in the last few days. They were all fantastic!! Thank you for what you do. Just tried this w/ buttermilk. Fabulous. I made this on the weekend for 20 people for a brunch, I laid them all out with all the other stuff, most of it not that great for you. I was worried that they wouldn’t all go. Then as the first person took one and tasted it the word spread, from there away they went, one by one. Until there was only 2 left. Luckily I managed to get the last one. Awesome and so easy. Thanks Sarah. I would love to be on your mailing list. Your recipes look magnificently delicious! Question about the spices in the strawberry sauce – do you crush them finely and leave them in with the strawberries when serving? Or do you crush them roughly and fish out any large pieces before serving? Thank you! I’ve been having this for breakfast all week – so delicious! I love how you gave the muesli recipe for one serving and the strawberry sauce for 6-8. Then I could ladle as much sauce as I wanted! I especially enjoyed the chia seeds in the muesli – I’ve tried chia seeds in other things and never cared for the gelatinous texture but in the muesli, it really works. 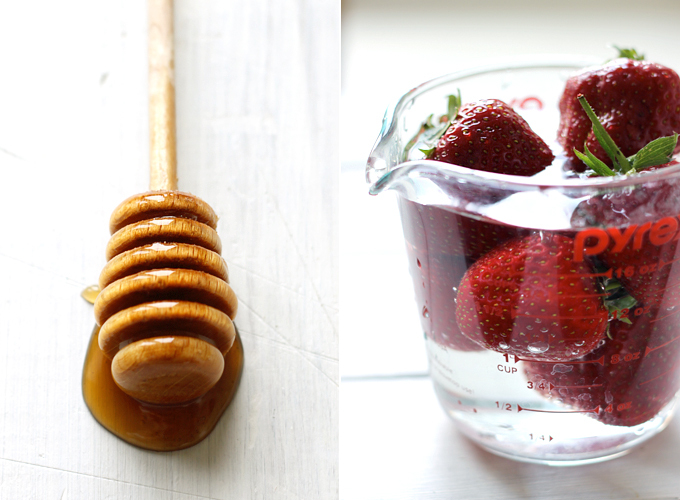 Just to say that spiced strawberry sauce is great…. I’ve just added a splash of rosewater too – can highly recommend!!!! Thank you for your blog! This too is a super recipe. I found it in January when there was not a strawberry worth eating in sight (I live in Canada). So I made it with frozen berries! In this version the stuff virtually makes itself: take out berries (appx 4 cups) from freezer the night before you want to eat it, mix all the other bits in with it, let sit on counter overnight, mash in the morning (though it sort of self-mashes as it “wilts”), eat! As the berries defrost they absorb the beautiful spice blend and do their marinating thing. Also, I was lucky enough to still have some local berries I froze in season so that I’m sure helped the flavour. This is a great out of season option. Hi Sarah! I am new to My New Roots but already love it! Thank you for being such an inspiration. You are opening my eyes to a possible career change that I’ve been longing for…I am thinking of becoming a Holistic Nutritionist! As for the above recipe…looks yum! But quick question…I have been told that I have to soak the oats in water for 5 minutes before draining and using for the bircher muesli. Is this correct? Thanks again for your wonderful blog! i know the point of this recipe is to have the oats raw..but i really like my oatmeal warm. would it be very detrimental nutrition-wise if I gently heat these oats in the morning before partaking? Any thoughts on combining this recipe with the recipe for homemade goat yoghurt? Could you make the yoghurt at the same time as you soaked the oats or would it be better to combine them after the yoghurt was done/cold? Hello there! I’ve been coming to your lovely recipes often and now I have a question! For soaking most grains, I soak, rinse, and cook in clean liquid because using the soaking liquid would mean taking in all the acid you’re doing away with. I’ve only tried soaking oats once, and did so with Buckwheat groats (which i didn’t love) because I read that on their own, the oats don’t break down well enough. SO, the question here is, does your recipe assume the oats are presoaked? Or are they simply soaking in the liquids of the recipe? . Instead of using nut milk or water I use water kefir for my Bircher Muesli. Very delicious! Have just made the sauce and used a bit for your almond butter cookies, oh my gosh! The highlight of my Sunday! I can not wait to wake up tomorrow and enjoy the muesli with the sauce. Will probably crumble the almond butter cookie on top of the meal, just to make sure the week starts right. Thank you for such an inspirational blog, I am truly grateful for this possibility to learn so much from you! One nutrition question to your post on overnight soaked oats (or nuts as well) and the role of phytic acid in our body. It seems to me that soaking has been recommended to neutralize this acid (to get rid of it, as people write in their comments), however I have come across various studies and sources on Inositol (i.e. a plant form available in phytic acid) found in these foods as playing a crucial role in body’s health at cellular level (especially cells of brain, bone marrow, eyes and intestines) and has recently been prescribed as cancer fighter or as prevention of other diseases. I feel a bit confused about this. However I guess, to maintain a balance of nutrients in our body (and when not in a medical treatment), one should simply change their eating/cooking habits from time to time, or? The jar is just a canning jar, I think 500ml. Have fun – you can’t mess this one up! This looks amazing. Can’t wait to try it. What kind of jar did you use? And what size? I’m planning to purchase a few to start making this and would love to get it right on the first try. I made both the bircher muesli and the spiced strawberry sauce last night for breakfast this morning (sadly minus the star anise as I had run out) OH.MY!! Those strawberries are AMAZING, seriously amazing. And together with the muesli it was just YUM! My nearly two year old liked it so much my poor husband had to sacrifice about a third of his breakfast for him, the boy ate his own then looked at his Daddy’s bowl with his big brown eyes, and breakfast was over for the poor guy! Thank you for the recipe! I’ve been trying to find if it matters if you cook the oats or not after soaking. I like to eat them cold, but is cooking required for removing phytic acid, too, or is it just the soaking part that matters? Wow, I love the idea of sauces for my bircher. I love eating it with pistachios, honey and Papaya or good ol berries and toasted almond!! I knew soaking made grains softer, but did not know it made them more nutritious. So interesting. Thanks. I eat bircher muesli every day but i make mine with apple juice and vanilla greek yogourt. The original recipe calls for a grated apple to be added in the morning but the apple juice gives the needed bit of acidity to balance everything out. I eat it with rasberries and sliced almonds. Perfect food. I have a question about the soaking of the grains and nuts in this recipe. Is this correct or do I have something wrong? I am about to try this one again, but this time with kiwis. Thanks for this recipe, Sarah! You got yourself a fan from the very first day. Would this work with quinoa flakes? Strawberries are not my favorite berry, but I think I would like this preparation of them with all of the sweet spices. Doesn’t your milk curdle from the lemon juice, producing a nasty texture (or perhaps that just happens with dairy milk)? Love your blog and have a quick question about oat soaking. I thought you had to rinse the oats after soaking overnight to truly get rid of the phytic acid – however doing so is extra work which I’d prefer to avoid, but I agree with you on the importance of eliminating the anti-nutrient acid. What do you think? This is the real thing. Yummy! Strawberry sauce with your goat milk ricotta, on top of sourdough buckwheat crepes=amazing Sunday brunch! I blend in a spoon of raw cacao powder – great! Just the muesli itself was delicious! Now I’ve got to try the strawberries. Yum! I just ate my Bircher Muesli with raspberries, blueberries and honey 5 min ago. YUM. I have one question though. It is alright to leave the Muesli in the fridge for another day? I couldn’t eat it all. So enjoying the bircher muesli & strawberry sauce. Your blog is one of my favorites to check in on, morning coffee in-hand. Thank you! I love this kind of treat with buckwheat groats, that I soak the night before. Yummy! I love bircher muesli, but I actually never added chia seeds. Last night I made it and I tried the oats today and it had such an amazing consistency! Thanks for the tip Sarah! And congratulations on the success of your classes in Amsterdam, I hoped that someday you would bring your amazing cooking lessons to Portugal. Beautiful photos! So bright and alive. Thanks for the recipe and the inspiration. Another My New Roots power breakfast! I just prepared this for tomorrow’s breakfast and I cannot wait for night to become morning. I used grapefruit zest and coconut water. Yum. Once a Bircher Muesli skeptic and now a convert, I often make it with coconut water and goji berries. I also like adding flax seeds now and then. That spiced strawberry sauce looks pretty epic. I love the way you layered the sauce and the muesli like a parfait. Strawberries have been so good lately too. Thanks for the recipe, Sarah! i have so many strawberries right now, i’m gonna have to try this recipe! thanks. amazing space you have..excellent photography..
Yum! I love that muesli is becoming more popular. Some toasted pumpkin and sunflower seeds add a great crunch on top! I LOVE the idea of that strawberry sauce! And now that the local strawberries are finally appearing, I’ve got everything on hand to make it. Thanks so much for the recipe! Sarah, I made this for today’s breakfast, and it was awesome! I substituted a naturally sweetened raspberry preserve, and added fresh blueberries. What a refreshing way to have oatmeal in the middle of a hot summer. Thanks for your insight and inspiring recipes! hmmmm,another vanilla-holic I see:-)) we should make a vanilla-club soon! …merci beaucoup for the link to me too – very kind of you! happy sunday+sunny smiles from tulipland Holland! I do not have a lemon. Can I use something else? My mother in law grew up in Switzerland and makes the best bircher muesli. She soaks the oats in yogurt and milk, along with two grated apples, fruits (peach chunks, cherry and grape halves and blackberries), nuts, and the juice of half a lemon. The apple and lemon juice are the traditional ingredients that take it over the top! Yours looks amazing as well! ugh, those dishes looks very delightful and so delicious. I wanna have some taste of those. I like to soak my oats in orange juice, honey and almond milk. I add in almonds and dried coconut the next day or sprinkle with homemade granola for a little crunch. delicious.. you make it perfect!! Fantastic post, Sarah! I got into muesli last summer and had some for breakfast this morning. I soaked steel-cut oats overnight in leftover homemade horchata (agave-sweetened rice and almond milk) and topped it with fresh raspberries. I’m really into your raw strawberry jam concept, it sounds and looks amazing! Hi Sarah, what a gorgeous recipe! Your photography is also stunning – I am a fairly new reader having been introduced to your blog by friends who are already dedicated fans! I am wondering too along with another reader above about the soaking of the grains and consuming the soaking liquid. It has always been my understanding that the liquid draws out the toxins inherent in the grains and therefore the soaking liquid needs to be drained and the grains/nuts/seeds be rinsed? Of course I’d love your thoughts on this as this looks super delicious and oats are a huge favorite 🙂 Your work is gorgeous! Thanks! Thank you for the great twist on our morning staple! We used cherries instead of strawberries (still waiting on them in our part of BC). Used half steel-cut half rolled oats. Super delicious. Added coconut, hemp hearts and a banana. I loved your idea of serving these guys up parfait-style in mason jars…Despite the early aversions to my creation, my partner was blown away by the pretty presentation and tried some. He LOVED it. And so did I! Next time-home made nut milk instead of water! We are recent fans of your blog, and our enthusiasm continues to mount! Thank you again! I have been looking around for a good, original Bircher Muesli recipe. I can’t wait to make it. and thanks for the camera info! I really love bircher muesli and often have it with grated green apple and chopped almonds, yoghurt, cinnamon and a little maple syrup. My kids would go mad for this strawberry sauce…please consider bringing your classes to Melbourne, Australia! Hi Sarah! I love your blog, I’ve been following for couple of months and got so many healthy tips from it. I soak every day, following your advices, but now I have a question about this recipe. So if you put everything together including the liquid, then the enzyme inhibitors will stay basicly, because you don’t rinse the nuts, aren’t they? This looks so good. I adore oats…but always end up cooking them! I think i will also try this method adding in somwe raw buckwheat groats to soak also. Any topping covered with a genrous sprinkling of cinnamon works for me! Thanks for the bircher muesli recipe. If you don’t mind, can you submit your bircher muesli with spiced strawberry photo in http://www.foodporn.net ? I am making this for breakfast tomorrow, so excited! Thanks for the recipe 🙂 I’m going to do the bircher muesli and add cinnamon, raw honey, hemp hearts, berries and banana in the AM. hi. i love you. that’s all. wow that strawberry sauce sounds so delicious! YUMM! thanks for sharing! This is stunning! Thanks for such an exciting breakfast solution. I normally like a smoothie but I work really, really early and can’t bear to torture my lovely neighbors with the sound of a Vitamix at 5:30am! This is my all time favorite breakfast in the summer. Although, my REAL favorite, is cold cooked oatmeal. Soak in the morning, boil in the evening, blend in strawberries and bananas and raisins. Put in the fridge, and go to sleep (or just stay awake). Serve cold oatmeal with berries and yogurt/milk and of course a lot of cinnamon. Yumyumyumyum. I tend to use 1/2 cup oats, 3/4 to 1 cup unsweetened soy or almond milk, 1/2 banana (and sometimes add 1/4 raw walnuts and cinnamon) and let all of that sit in the fridge overnight. Then I add toppings in the morning. Lately it’s been 1/4 cup of fresh blueberries. If I didn’t add nuts the night before I may add sliced almonds, chopped walnuts or whatever else I have on hand. The fruit varies, too. I’ve also tried nut butters and next on my list is cocoa! 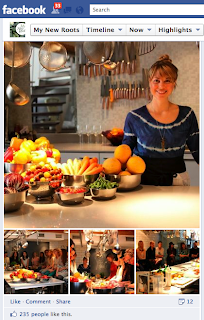 I love the opening line of this post – in addition to the recipes, of course! Life is about listening, learning and eating with intuition. And eating as many strawberries as you can while they are in season!! What a lovely breakfast, I particularly like the idea of that spiced strawberry sauce. Perfect to wake up to! I believe it that the nutrition of the oats increases with soaking. 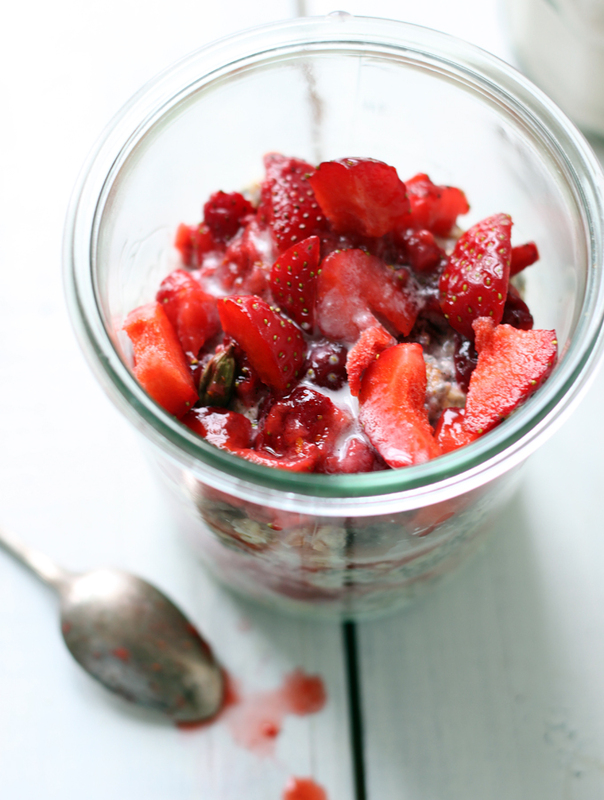 Overnight oats was one of the first posts I did on my food blog ever! I can’t believe I haven’t done it in so long….especially since I’m eating Mila – a blend of open chia seeds that is awesome – so now I’ll have another recipe to try it with. Many thanks! You may have to soak them a little longer than overnight, but give it a try! Looks amazing! Oat groats should work well too, do you think?